I’ve added (considerably) to my agave collection this summer. When the weather is hot, and the rainy season is months away, I forget I live in Portland and that most of them will need to be protected over our wet, cool winter. Since we don’t have a greenhouse that means they’ll come inside the house and hunker down in the basement, under grow-lights. Not ideal, but better then getting soggy and rotting. I was thinking about this the other day when I stopped at Garden Fever to find a small pot for the Agave 'Blue Glow' I purchased at City People’s Garden Store. I held strong when I saw these beautiful specimens. 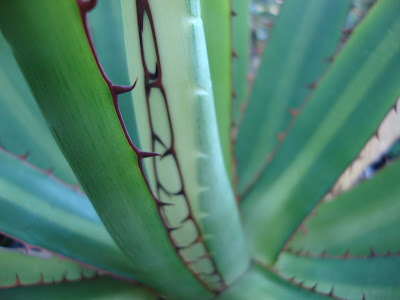 Aren’t the markings on the Agave hartmannii (top and below) gorgeous? And the Squid Agave was calling out to me; it’s long sinuous tentacles reaching out to caress my hand… Do you have any idea how much strength it took to just turn and walk away? Imagine finding a 100 dollar bill on the sidewalk and not picking it up...that’s how much. With no basement, no garage and no greenhouse, you can just imagine what our house looks like in the winter months. It works OK until the time comes to put up a Christmas tree. When the spring move rolls around, I can almost see our living space as "minimalist". We typically have wet winters too, Loree. Will the agaves not make it through in a sharp-draining pot outdoors? Oh, Loree, you're singing my song! You're to blame, ms. danger garden, because many of my purchases were influenced by your agave enthusiasm. But it's all good: we have a sunny breakfast room that will be pressed into service for the potted agaves (now numbering six) and the prickly pear I raised from the dead. I hope it works for them...we shall see. ricki, yikes! Maybe you could decorate all the plants and skip the Christmas tree? Ok, who am I kidding...I have to have a tree. Pam, I did a little research about our 2 climates. From what I found Portland’s average annual rainfall is 5-8” more than Austin’s. In the winter months (December, January and February) your average highs range from 60-65 and lows 40-44. Our highs in the same months average 45-50 and lows 34-36. Too much information? Sorry…I love this sort of thing. So I think my situation boils down to a few things. First, it’s a little cooler and a little wetter here, potentially causing harm to the borderline agaves. Second, a few of my agaves are unknown species, like the light blue and solid green ones from my brother; he’s not a tag keeper. Not knowing what they are I am hesitant to experiment too much. I lost a couple of nice Agave Desmettiana pups by planting them in the ground back before I had identified the mother plant. Third, and most importantly, I am a chicken. I should be more adventurous and experiment, but I just hate the idea of loosing any of them! Stephanie, it is just so graceful! Not too much info at all, Loree. I'm interested in the differences between our two climates as well. I didn't realize Portland is that much colder than Austin in the winter, though I was pretty sure you didn't get down to freezing very often. The reason I asked about wintering agaves in the ground is because I'd read an article by Dan Hinkley with pics of agaves in the ground in his WA garden. I was surprised to know that they could be grown in the ground there, so I thought maybe you could too. You are quite right, however, that the cold tolerance of agaves can vary greatly, and A. desmettiana is particularly cold tender. It can die back in Austin's winters too, though I'm risking two in the ground right now. Fingers crossed! Anyway, they are certainly worth all the trouble, aren't they? Loree & Pam - I've been taking note as I find in ground agave survivors in Portland - the ones I've seen thriving year after year are in steep rock gardens. In hillier Portland terrain, in addition to the benefits of a rock wall structure for drainage, the soil is noticeably different than the flat spots. My mom's garden, you can't stick a shovel in the ground without hitting a rock. I'm two miles away, and have never found a rock in my soil once. Her soil drains much better than mine in winter, her plants are bigger and better than mine consistently, even though I'm diligent about amending my soil every year. Her neighborhood has seen some good agaves through the winter, I've yet to find them down in my hood (but I'm still going to try with the toughest agave I have. I pulled my agaves under the eaves last year. I had them in pots filled with regular potting soil (this year I repotted with a mix of potting soil and chicken grit). Turns out the gutter overflowed on them, so they got heavy water at times. I lost an unknown probably not hardy big blue agave I got at Fred Meyer, but the rest survived, with a couple leaves sacrificed. I wrapped them in frost cloth and burlap when we got freezing temps. My big regret was trusting the weather forecasts, they'd say a low of 38 and then it'd hit 29 and I wasn't prepared. I think the rule at the Chinese garden is that they protect their non hardy stuff if temperatures are forecast below 40. Probably way too much info, but in case anyone else is planning their Portland agave protection, this was my experience last year. A. americana variegata was a real trooper, it looked almost perfect, although I cut off a couple lost leaves at the bottom. A. havardiana did fine, but I think drainage was definitely an issue, it had some black spots that cleared up when I repotted with chicken grit. A. attenuata I stored by the basement door, dragging it in and out according to weather. That didn't work out at all. Between light deprivation and putting it out too soon, I nearly lost it completely, it's just coming back now. Not agaves, but a couple non-hardy yucca and echeveria I stored in my breakfast nook, the coldest room in the house, which gets decent natural light, and they fared the best of everything. I'm thinking this year everything should get moved into that room. I thought I had the perfect spot for an agave: berm (thus good drainage) in full sun. The one I lost was purchased in the fall, and our '08 winter was a doozy, so I figured another try was in order and consulted with Cistus' agave guy. Here's his advice: plant in the spring and baby along with sufficient water through the summer. I'm guessing that even so it might be a good idea to wrap it up if we have another arctic blast. I'm up for trying this approach. If it doesn't work, I guess I will just have to squeeze another pot into our living room...and learn some improved negotiating skills. I wonder if you or one of your commenters might be a little bit more specific about over-winter care of agaves in Portland? I have several in pots and am wondering how to best care for them this winter. Should I withhold water? Do they need a lot of winter light? Could I leave them on my sunny front porch with some extra protection from freezing temps as needed? Or would they be better in the detached garden shed or basement? Any specific advice you could give would be so appreciated! Love your blog, btw! It's one of my favorites! Pam, they are so worth the trouble! I do have a few in the ground...and I am going to post about them next week...so more on that to come. As Megan said our local soil type varies greatly within a relatively small area, that makes a big difference. And with Dan his gardens have been right on the Puget Sound which acts as a temperature moderator and keeps things much warmer. Megan, thank you for all this valuable info! 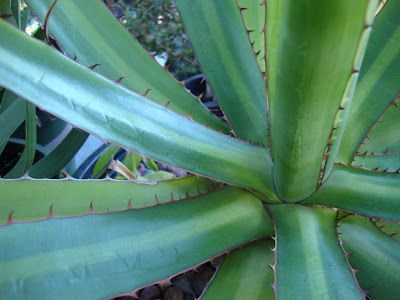 Maybe you could create an map to the agaves of Portland? Sounds like I am kidding, but I am not! I need to start stocking up on my wintering over supplies. Your breakfast nook seems like it could be an almost ideal non-greenhouse greenhouse (if that makes sense). Your detailed info (and the request from "S") has inspired me to do a follow up next week on my agaves in the ground. Here's hoping I will have glowing things to report come spring. S, thank you for commenting! This coming week I will do a lengthy post about my agave over-wintering care in previous years and what I plan to do this year, hope that will help with a few of your questions. 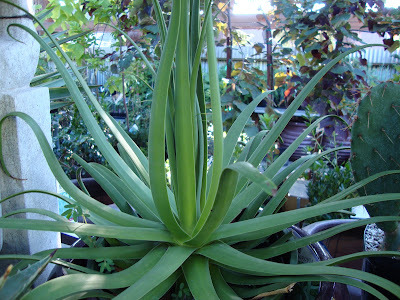 It really comes down to what kind of agaves you have, their cold hardiness can very greatly. So glad to learn there is another agave lover out there in Portland!! ricki, yikes! Sorry I missed your comment. What you describe Sean (you say Cistus I assume Sean...) saying to do is exactly what I have done with a couple new agaves. We will have to compare notes come spring.